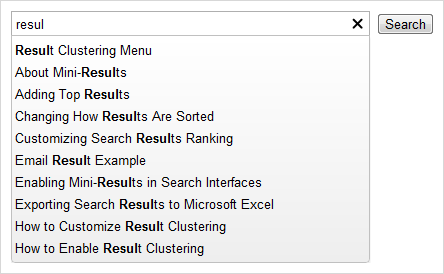 The Coveo search boxes can feature query completions to help reduce query typing and suggest relevant queries or search results that you can immediately select. The typed string matches the beginning of words anywhere in the suggestion, thus maximizing the probability to quickly find an appropriate suggestion. Example: In an online help system, query completions can suggest a list of available topic titles. In a Coveo search box featuring query completions, start typing the first characters of a term of interest. Matching suggestions immediately appear below the search box, with the typed characters highlighted in each suggestion. Suggestions containing the typed characters in the first word appear at the top. Example: In the My Emails .NET search interface, to find messages received from or sent to a person, type one of the field aliases (to:, from:, cc:, bcc:), and then the beginning of the name or first name of the sender/recipient. The matching sender/recipient names appear. When needed, continue typing more characters to dynamically refine the suggestions until you find a more appropriate suggestion. Press the Tab key to select the first suggestion, and then press Enter. Note: CES 7.0.5785+ (August 2013) Support for the Tab key selection. On the keyboard, use the vertical arrow keys to highlight the desired suggestion, and then press Enter. On the keyboard, use the vertical arrow keys to highlight the desired suggestion, and then press Tab. When you want to erase the last term, on the keyboard, press the Ctrl-Backspace keys. When you want to clear the search box, click the x at the end of the search box. Press Enter or click the Search button to launch the edited suggestion.